Today I started work on building a working version of Ubuntu 14.04 LTS on Beaglebone Black with all the necessary stuff to run GNURADIO and HackRF. I tried a pre-built version of this recently that kinda 1/2 worked. So since I can't seem to get a fire lit under that version, I've decided to create my own. Here is what I've done so far and it currently building as I write this. So I'll post updates on this post as they occur beyond what I have so far. I use a Windows 7 PC for my primary Desktop computer. I use SecureCRT for SSH from this computer to various things I need to SSH to. In order to see various GUI's from the BeagleBone Black that are run under 'X' There are a few things I need to do in order to see the 'X' windows generated by this BeagleBone and Ubuntu setup. 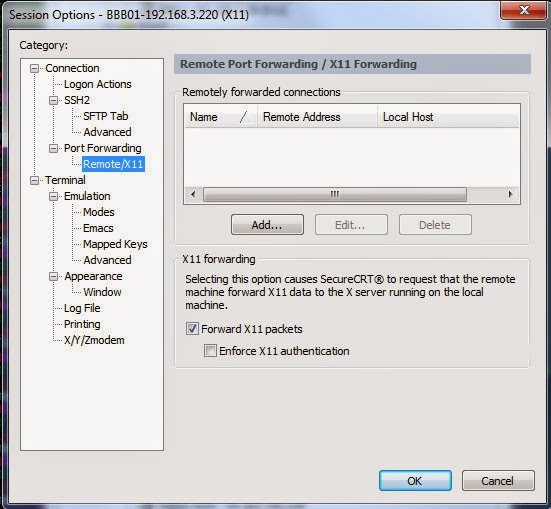 In secureCRT check 'Forward X11 Packets' under "Connection" > "Port Forwarding". Install "Xming": http://sourceforge.net/projects/xming/ Run xming on windows. SSH into BBB and try running something that requires 'X'. That's it. Works. Very simple. The key is having a local (on windows) "X server" running, and that your SSH client supports forwarding X11 Packets. CONNECT YOUR DHCP Network RJ45 to the BBB. (you'll need to locate the IP to SSH to from your DHCP/Router's list of connected devices mine shows up as 'ubuntu-armhf'. SSH to it like you would any normal port 22 ssh connection. = compiler ran out of memory. = available on the device. Once you are done with all the compiling you'll want to disable this again!!!! = Now, let's set up your swapfile. Ok, now you have a 2GB swapfile and it is enabled. Let's make it permanent. = NOTE: THIS WILL TAKE A LONG WHILE! 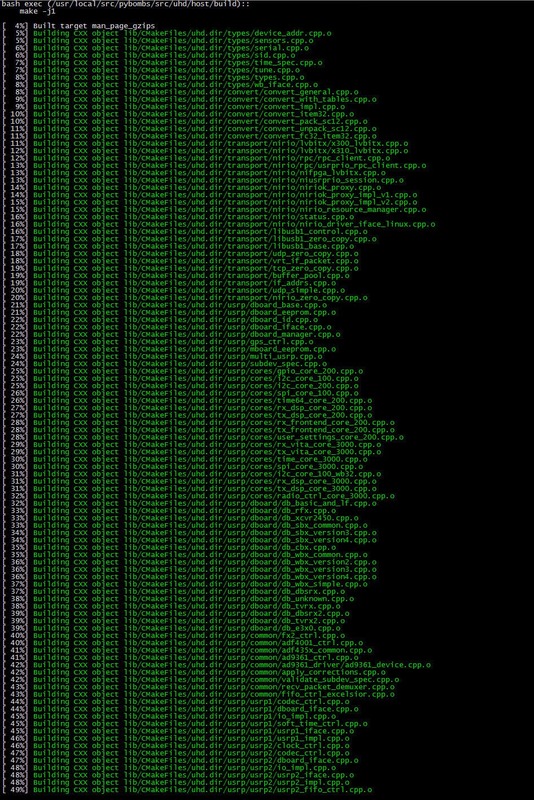 NOTE: Your SSH TERM will be showing things that look like this...this is pretty normal. 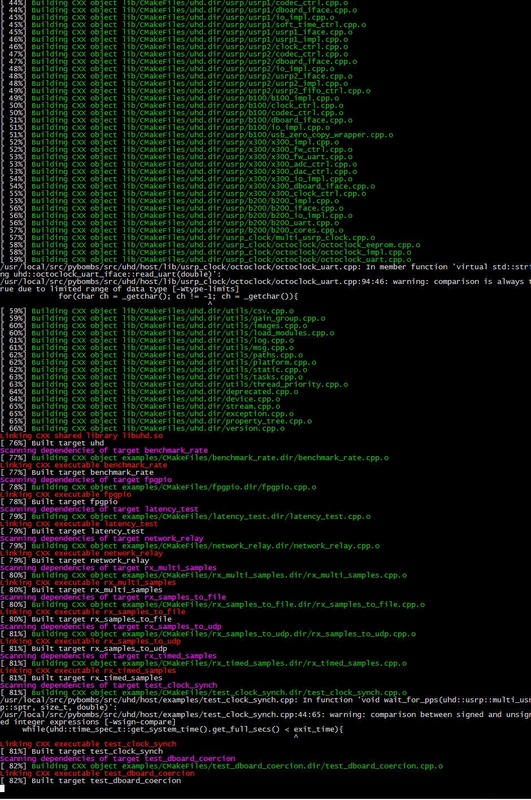 GNURADIO compile via 'app_store.py' takes HOURS like this 6-10 hours at least. But it does complete! Probably could use 2-3 threads with the SWAP available, but I doubt it would much faster since there's only a SINGLE CORE. cmake ../ -DCMAKE_C_FLAGS="-march=armv7-a -mthumb-interwork -mfloat-abi=hard -mfpu=neon-vfpv4 -mtune=cortex-a15" -DCMAKE_ASM_FLAGS="-march=armv7-a -mthumb-interwork -mfloat-abi=hard -mfpu=neon-vfpv4 -mtune=cortex-a15"
About 8 hours after that.....This completed. Stop and see how things work now.... be back when I'm done checking the install out so far. If this is ultimately successful at least I'll be able to create an ISO image that I can reuse for the short term. I think next steps will be to use one of my larger RISC based CPU Linux boxes and do cross-compiling to the ARM based system. I have several 24 core, 24Gb Linux servers I can use to do this. And these builds would probably complete in total within about 15 minutes instead of DAYS. 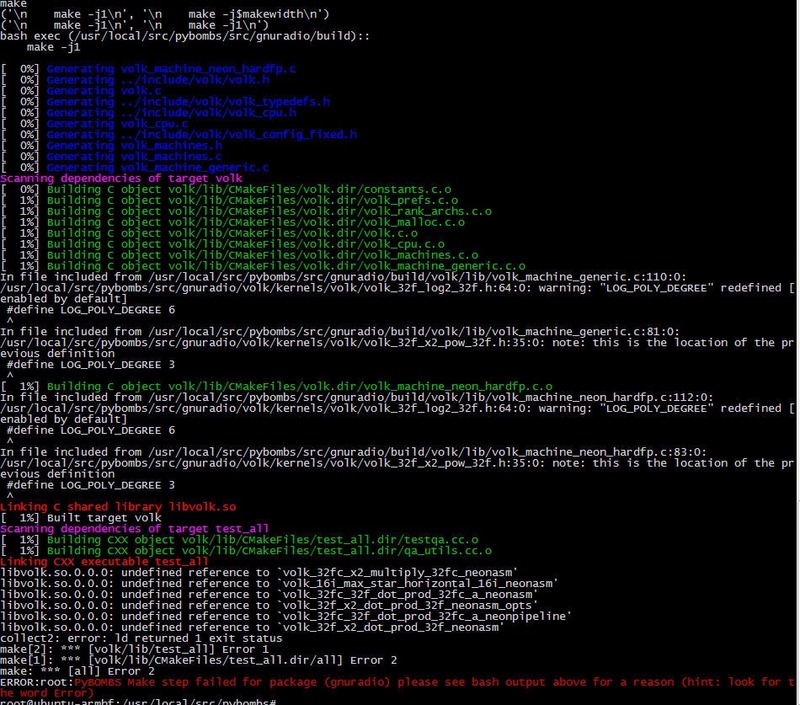 Anyway, I'm still waiting for volk_profile to work its magic while the single core BBB is crunching away on it. More when that completes. 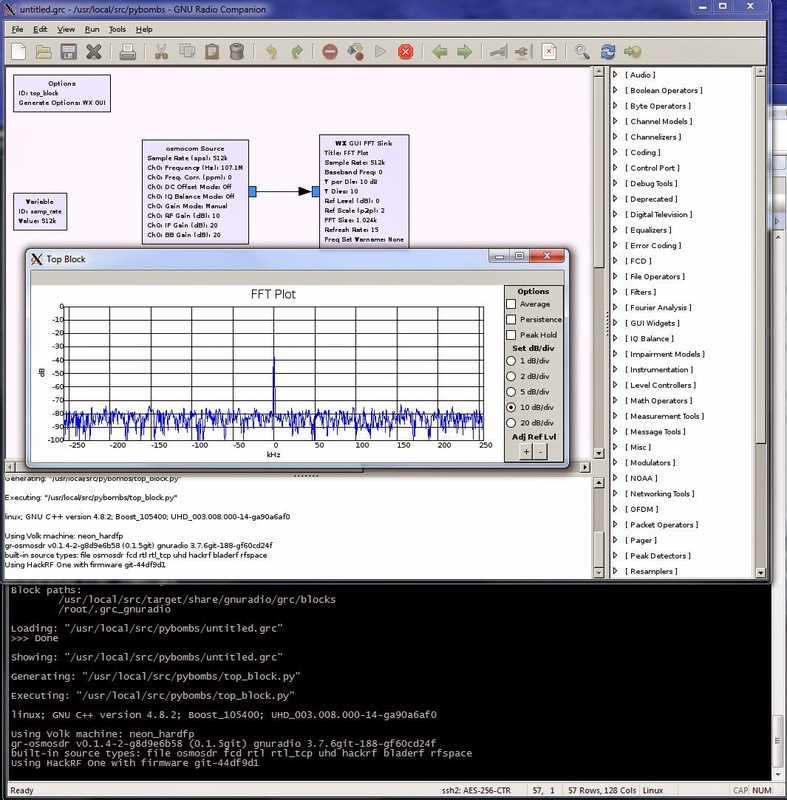 After all this...I'm FINALLY able to access the HackRF via GNURADIO on my Beaglebone Black! I'll post more info soon! next to the line with 'plugdev' I added 'ubuntu' to add the 'ubuntu' user to this group. 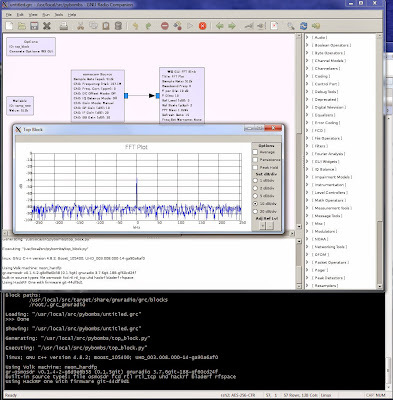 Now gnuradio-companion will be able to access the hackrf device when being run by the user ubuntu. Any further posts about this will be in NEW posts. This one is closed now.